My kids love to dress up and play pretend. Our toy box is stuffed with lots of odds and ends that help spur their imagination and takes their pretend play to a whole new level. Sure we have baby dolls, magic wands, superhero capes & more princess crowns than I can count but sometimes the kids need a little encouraging to try something new with their play. Prop boxes are the easiest way I can think of to help them change out their play. We have gone ice fishing off an ice burg (the side of our sofa), hopped over hot lava (the couch cushions are remarkably flame retardant) and entertained kings and queens with singing and dancing. I’ve created and rotating our pretend play boxes for years now and have seen lots of dramatic play in our house even when the boxes aren’t being used. During the first few times we open a new box, I spend time playing with the kids demonstrating how one would play with the items. After awhile, they get the idea and then play just takes off from their own imagination. *Including props that both boys and girls will find appealing also is important. *Choose real items that can be used safely, and not “toys.” For example, children can do and learn so much more with a real, but broken, telephone than with a toy telephone. Include literacy materials in every prop box, so children can pretend to read and write, even if they’re not yet able to really do so, and can associate literacy/numeracy activities with meaningful contexts. *Ask the kids what they think should be included. You don’t have to do everything yourself! If they’ve visited a greenhouse, they’ll know lots of items to include. Follow Heather Lawrence’s board Gardening Crafts for Kids on Pinterest. How do you play with your kids? This would be awesome for my boys. I want to garden this year and involve the kids, I am definitely going to make up a few of these for them . I love this! My mother loves to be in the garden and my 3 year old is actively involved! Thanks for sharing this! This would be perfect for my daughter. She loves helping me in the garden. Ooo – I love the idea of prop boxes and you really came up with some very cool ideas. I like the gardening one the best. My daughter loves tinkering with anything — even gardening! This will definitely add to her interest! I like this idea! My son loves to help me in the yard, and I imagine he would really like to play make believe gardening when it’s too dark or too rainy outside. I had never heard of a prop box before. This idea is brilliant. I also like the idea of getting children used to the idea of gardening at an early age. I find that the easiest way for me to play with my kids is to have a theme for each day of the month. I know it sounds complicated at first, but only for a few months and after you’ve been doing it for a few years it’s actually makes life so much easier for mom. So for example, today was a Construction Day so I pulled our construction set out of the basement and kids were playing with it all day: independent pretend play, bolts and hammers counting (math), reading construction books (english), painting construction site (art). And if I leave this set out nobody would touch it at all and we will be tripping over it for nothing. So tomorrow it goes away and out comes Shake-and-go cars set… Now where are the books about cars? We do something similar here. We have a theme for the month and then at the beginning of a new month we will change it to something that they are showing interest in. I totally agree on rotating toys. We brought the zoo out from hiding and the kids played all day! I’m so looking forward to warmer weather! I’d love to make this prop box for my little girl! Fun idea! We have a few prop boxes around here, too. 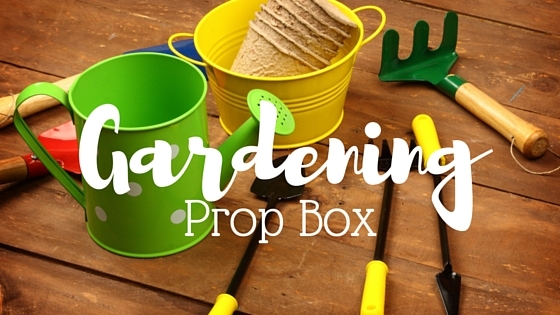 Have your kids tried out the gardening tools yet? We filled a plastic kiddie pool with dirt and my toddler just loves it! My kids are itching to get outside and dig in the real dirt. The greenhouses are advising to wait until next month but when you already see tulips and other plants coming up already it’s really hard to wait!! This is a fantastic idea for gardening packed in one box. Children can learn about nature, while having some fun at the same time. Such a cute idea. When my daughter was little, I’d put her out in the garden with me and let her dig with her little tools. Great post and great photos! I absolutely love gardening with kids theres so much joy but also so many lessons in it! Thanks for sharing! This is such a fun gift idea. I’m all for anything that connects kids with nature and gets them outside. I think I might get this for my daughter. She has been showing an interest in gardening ever since my tulips started blooming. What a great idea! I just LOVE this idea….anything that gets kids outside, away from computers, playing in the dirt, and who knows…maybe even helping a bit with the gardening. What a cool present. This looks so great. I use to teach preschool and this would’ve been great. This sounds like a great way to get kids into gardening! Great post! This is such an excellent idea! Fantasy play is such a wonderful way for kids to use their imagination. We used to have a restaurant kit with the real restaurant order forms and the kids took orders all the time – pretty much every time we sat for dinner. This is a great idea. I know my sister lets her kids “help” with the gardening. They are too little to really do much, but they have fun, so it’s worth it. I love this. My daughter and I just planted some herbs, that are growing! Yay. She is so proud of herself. This weekend, we’re going to get some flowers to pot. 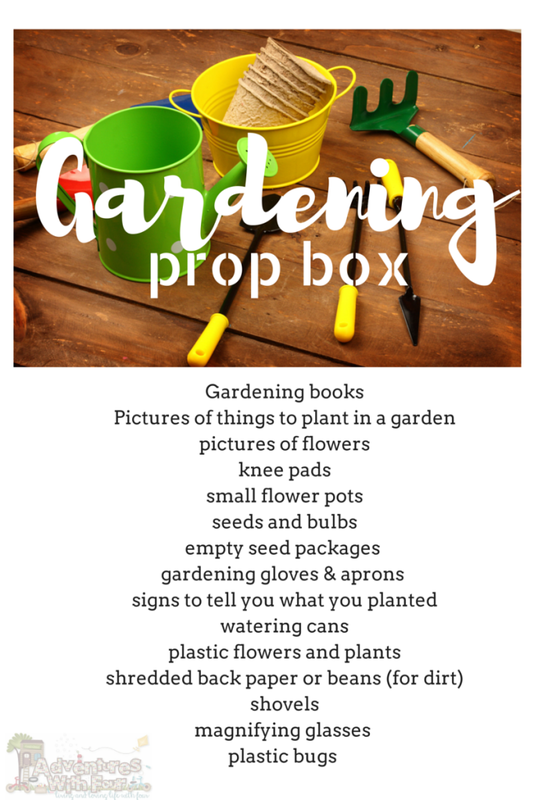 What a great idea what a lovely box this makes gardening with the kids so great. I will pass this song to my friends with little ones. I love this idea! My niece would have a blast with this. We did this with our boys – it was fun for them, and it helped us stay more organized. I love gardening but this year, I won’t be able to do it since we are moving to a new place. I used to do this with my kids. This is such a cute idea! My daughter is 3 and I think she would love to play pretend with these this spring. I’m all about real and imaginative play. This looks like fun and we could garden together! That’s what it is all about! Gardening is a great activity for young ones. It is great to give them real tools created with their age in mind. I love this idea. I will be making a garden this year for the first time in years. I need to go buy all the tools i will need. Such fun thing to play with for the little ones. My little niece and nephew would have a blast playing with those. I love to find posts like this one. We’ll def. be doing a little gardening this summer! I love this! My daughters would have so much fun. We use to have a huge garden, but it got to be to much for us. We now want to make a smaller garden. Hopefully when we move in to our own home we can do that. What a lovely little box. It gives you everything to start and keep your garden going! This is awesome! My kids are just getting interested in gardening and I love this idea! Such a great idea! My kids would actually use these props in our garden instead of playing with them – I love to get them real tools to use! This is a great idea because it lets kids imaginations take flight in all kinds of ways. I love seeing what they come up with! My kids love to play pretend. I’m always looking for new additions to the dress up area, and this is perfect! I love the idea of using the real tools. My daughter also loves to pretend to write. It is just scribbles now but she will read it like a story and it just melts my hear. Great information. I plan on doing a little garden with my kids over the summer, they have been wanting to plant vegetables. This is amazing! I am all about things that get kids imaginations going, I am going to have to come up with some of these! This is a wonderful idea. This will get my little ones working in the garden more. How cute! We have not made prop boxes before but my toddler would just LOVE this. We just started gardening together and she would get a kick out of this. Prop boxes work really well with little ones up until kindergarten so this is a perfect way to extend her play. I love that you choose to use ‘real’ props instead of toys. This is such a great idea for my daughter who just turned four years old. I like your idea for prop boxes for little kids. My children are at the age though where if they are going to be using gardening tools I actually want them out in the backyard using them for real. Nice to get kids comfortable with items like these at an early age so kudos to you on this great idea. That is a great idea….using the real things. Kids need to have lots of fun learning gardening. I love that you choose to use ‘real’ props instead of toys. Like Karen said it is far more organic and gives them a better indication of life. Same here. I think it’s better that they learn using the real thing so they can get a feel for it. A prop box is such a cute idea for helping kids pretend. I love that idea so much. My kids used to use our kitchen as one big prop box. This is a great post! I love to set up little scenes for my kids to run wild with their imagination. What a great idea for the little ones! They learn so much at this age and it is so much more fun to have props and visual guides. This is a great idea! I remember liking playing with real things more often than toy things. Especially kitchen things like pots and pans! What a fun prop box! I totally agree that its SO much better to be “real” items instead of “toy” items. It makes the learning much more authentic and organic…and so transferable to life! I think a prop box is a brilliant idea. I am ALL FOR ways to help kids get their imaginations working and this gardening one is fantastic.